From Victoria Sponges to Schichttorte: The Great British Baking Show is BACK! Chopped. Hell’s Kitchen. Iron Chef. Top Chef. Master Chef. Name a cooking competition show and I’ve probably watched it. Not because I love to cook—I can bake it or leave it—but I do love watching other people do it. Last year, quite by accident, we discovered The Great British Baking Show on PBS and promptly fell in love. 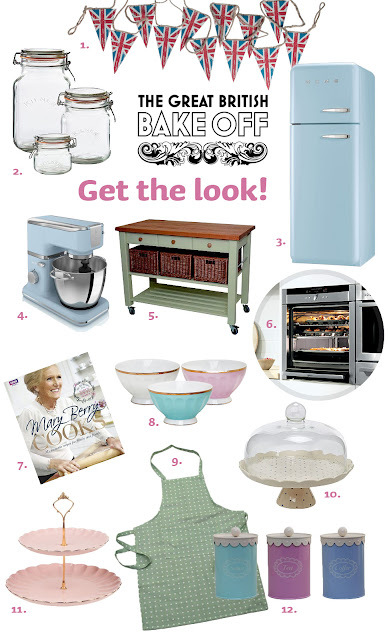 The BBC show—they call it the Great British Bake-Off—takes a dozen or so home bakers, puts them together in a pastel confection of a kitchen, under a tent, out in the middle of an emerald green field—last season we watched big fat raindrops plop down into a nearby pond— and presents them with a variety of baking challenges, from ‘simple’ Victorian sponges to Schichttorte (even harder to make than pronounce) until, ta-da, a dozen delightful episodes later, we have a winner. I don’t even think the winner wins anything; not a million pounds, not their own show, nothing except perhaps the honor of wearing the Best British Baker crown. And that’s not even a real crown, that’s just something I made up. 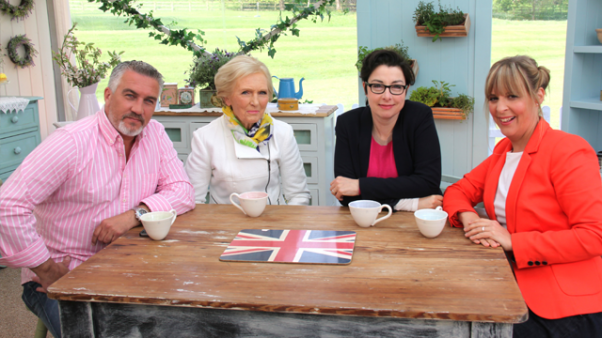 Maybe it’s that, the lack of dough, that makes these British bakers the most charming contestants I’ve ever seen. Of course they want to win, they’re terribly invested in doing their best, but it’s personal pride that’s at the core, not a title, not prize money. Somehow they achieve that without bringing out the knives. There’s no cutting each other down, no bitterness. They rarely get defensive about criticism from the show’s judges; dishy Paul Hollywood—can that possibly be his real name?—and Mary Berry—can that possibly be hers? Instead, they bite lips, nod and agree with such a blushing degree of self-deprecation that I just want to cry! Which I did in heaps at the end of this season’s debut episode as the whole bunch piles in to give the loser person who had to leave the competition a giant group hug. The hosts, or as the Brits say, presenters, Sue Perkins and Mel Giedroyc, are funny ladies who keep things light and lively. One of my family’s favorite parts of the program? Hearing how the pair deliver the famous starting words: On your marks ... Get set ... BAKE! Sometimes it’s a guttural groan, another time it might be a squeaky high tone. It’s always different, always makes us smile. 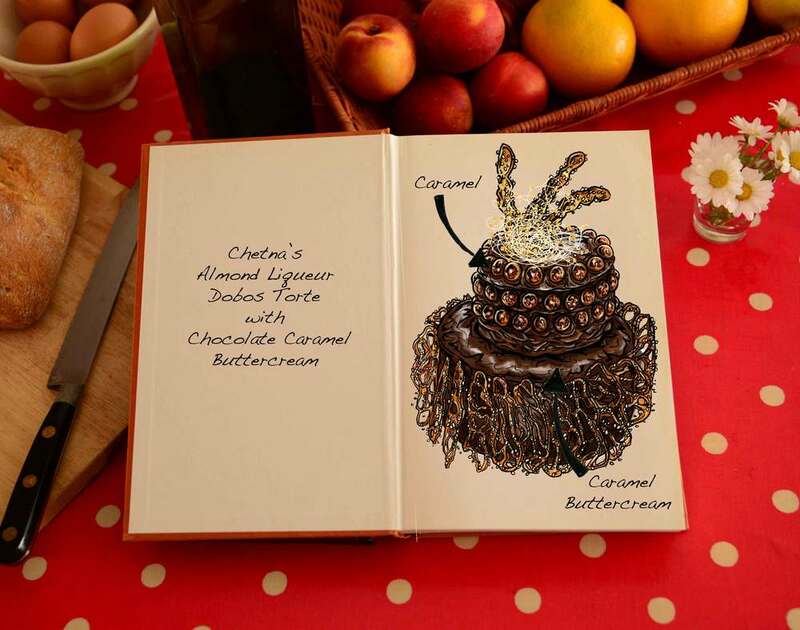 As do the delicious illustrations of what the contestants plan to bake. Things sometimes/often go amok and the baker’s concoctions get a little wobbly but the illustrations by Tom Hovey never do. They’re mouthwateringly beautiful. Hovey’s got a website with a blog that left me delirious. Obviously I’m a huge fan and chuffed the Great British Baking Show is back! Over 10,000 contestants were culled to come up with this year’s baker’s dozen of bakers from around the country. I devoured the first episode of season two this past Sunday, relishing the variety of accents as much as I did the look of their (mostly) luscious looking desserts and the look of the set, right down to the very groovy Union Jack banners I’m currently drooling over. You can find out how to get the look at AO.com and you can catch up with the show online or on the PBS channel if you have ROKU or whathaveyou. Check your local PBS listings for the time in your area. Are you watching the show? If not it’s too scrumptious—or scrummy as Mary Berry might say—to miss. Are you a fellow Anglophile? Play along like I do or just see what other Brit lovers are sharing at Joy Weese Moll’s British Isles Friday meme. I’ll be filing this on my own State of Britain page where I save all things British. Fun! I love that there's a "look" to emulate. And it appears to be a look that is elegant without being stuffy!